Features: 12-Inch x 10-Inch x 4.5-Inch Insulated, easy-to-clean, food-safe front pocket Front pocket can be used for snacks, lunch, or school supplies PVC, BPA & Phthalate free Reflective tape on front of bag for night-time safety Mesh side pocket for water bottle 2 zippered pockets Matching Nap Mats a available in most styles Embroidery friendly Great for daycare, preschool, or daytrips Recommended Ages 3+ Pattern Description: All we are saying is give peace a chance. 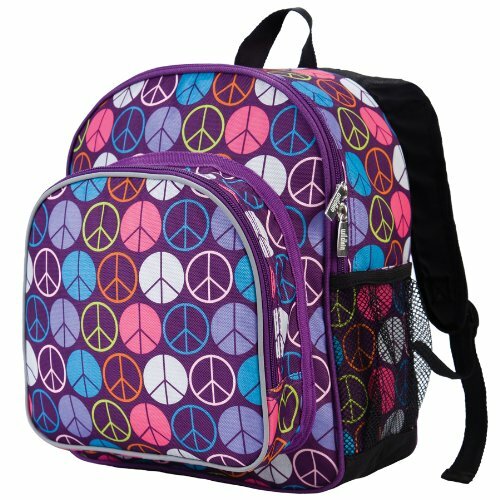 Our timeless, colorful Peace Signs are set on a purple background. Product Description: Our Pack 'n Snack Backpack combines two products into one economic space. This Backpack features a generously-sized, food-safe insulated front pocket that can be used to stow snacks, lunch, or school supplies. Perfect for preschool, daycare, and day trips. One-year manufacturer's warranty against defects - normal wear-and-tear, and misuse excluded. Rigorously tested to ensure that all parts are lead-free, bpa-free, phthalate-free, and conform to all rules and regulations set forth by the Consumer Products Safety Information Act.